We certainly saw it coming, but still got surprised by the strength of the sell-off, which accelerated after 2000 gave up to sellers. NDX could pause a bit after this bloodshed as the MTFS white line crossed over, but the fall is not over yet. 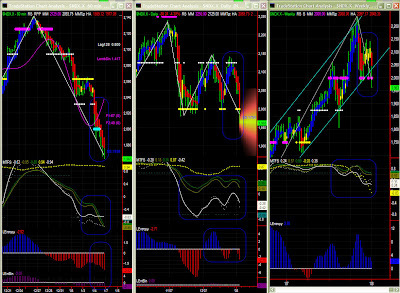 MTFS and Entropy still look bearish and the next support strong support level is 1938. (Look also at stall level just above 1950). Daily: down but support is possibly not too far now. The 60mins chart took over, and we did not quite expect 2000 to break so quickly. Being on the selling side, such surprise had no impact though. Significance level is suprisingly still high, and despite the fact MTFS is not showing any classical pattern (after the 'failed recovery pattern' mentioned in December), its lines are only showing a down gradient in median territory, and Entropy itself is not the most bearish. We also notice that the Swing indicator has some difficulty with fitting with the current volatility. One cannot discard continuation of the sell-off on this breakout, but indicators are not pointing towards that scenario yet. I had warned about the channel boundary. Prices may find a support level around Fib PR1 at 1938 which constitutes a strong MM level on the 60 mins chart.